In almost every review or survey written in local newspapers and magazines, Ford's Real Hamburgers is at or near the top of all the lists. For the past twenty years, Dr. Meat and I have used this restaurant as the litmus test for every other burger establishment. Every cheeseburger and basket of fries have been compared to this gold standard. We have always known that if we were going to have wedding, graduation or party, the quality of food would always be perfect. Both Meat and I had our weddings in William Land Park and walked across Sutterville Rd for our receptions and parties. This restaurant has both semi-indoor and patio dining. The cement floors are always swept and in the past year or so a few new tables and benches have been added. To my disappointment, however, the fountain that I posed for many years ago has been removed. The half-pound cheeseburger and fries came to our table within twenty minutes, but customers must prepare for longer waits if it is crowded. The fried patty was hand pressed, juicy and lightly seasoned. In the past, this fresh ground beef was perfectly seasoned with salt, pepper and Hungarian paprika. But it appeared that the paprika was omitted, and it lacked the exquisite flavor that we have expected over the past two decades. This patty was sandwiched in between two thick, rich slices of cheddar cheese and garnished with shredded iceberg lettuce, thin slices of red onion and fresh tomato. Their sauce is a homemade spicy 1000 Island type concoction. Although it was a bit thinner than usual, it is still the best topping in Sacramento. The bun is a special order bakery item from the local Muzio Bakery. It is fluffy, chewy and is man enough to stand up to the dripping half-pound patty. The "small" order of fries was a truck load of fresh-cut, skin-on Russet potatoes. They were thinly sliced in the McDonalds' fashion, but Ford's version tasted like potatoes, needed no catsup, and could be eaten as a meal. There have been many long lonely nights when I have fantasized about these sweet, perfectly shaped spuds. Ford's recently announced that it will be opening a second restaurant at the old Made-Rite burger stand on Fair Oaks Blvd. in Carmichael. This is excellent news for those readers living farther east, but the Burger Guys are concerned about their decreasing quality. It is still one of the best burger restaurants in the United States, but we have noticed some slippage in its attention to detail and sincerely hope that it is not a trend. 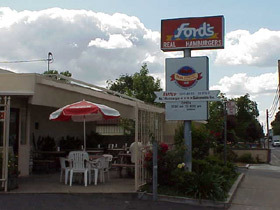 Ford's Real Hamburgers are somewhat of a legend to Sacramento locals. The restaurant used to sit isolated on the corner of Freeport and Sutterville across from Land Park, and many an eating legend abound due to the absolute perfection of the All American Classic and the store itself. My first experience with the "heroin of hamburgers" was in the early eighties, it was stormy, windy, and down right miserable (in those days you practically ate outside), but I stayed and feasted on one of Sacramento's finest products. It was the gold standard by which all others were measured. Today Ford's has slipped a little. The seasoning on the meat was a little weak, the bun was different; still good but different, and secret sauce AKA "Real Good" was runny and bland for this place. Don't get me wrong this place is still outstanding and only a fool would turn their nose up at this burger! The fries are perfect, they feature Coke products and upscale soft drinks like the Stewart's line. But as I have mentioned many times, we are out to find the Holy Grail, the Golden Fleece, or the Lost City of Atlantis of burgers, and I feel I must commit and say Ford's isn't it!